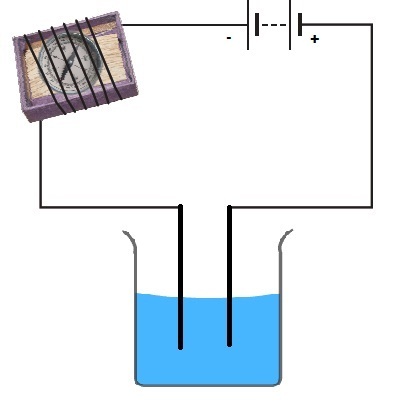 Some liquids are good conductors of electricity and some are poor conductors. Most liquids that conduct electricity are solutions of acids, bases and salts. The passage of an electric current through a conducting liquid causes chemical reactions. The resulting effects are called chemical effects of currents. The process of depositing a layer of any desired metal on another material, by means of electricity, is called electroplating. (a) Most liquids that conduct electricity are solutions of ,______________ and ______________. (b) The passage of an electric current through a solution causes ______________ effects. (d) The process of depositing a layer of any desired metal on another material by means of electricity is called _________ . (a) Most liquids that conduct electricity are solutions of , acids, basesand salts. (b) The passage of an electric current through a solution causeschemical reactions effects. 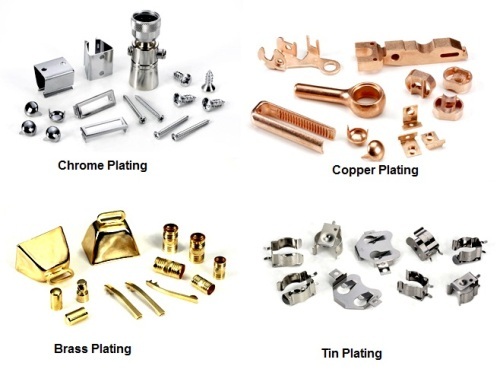 (d) The process of depositing a layer of any desired metal on another material by means of electricity is called electroplating . 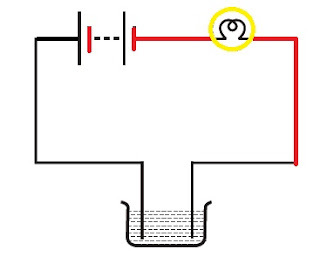 Answer : When the free ends of a tester are dipped into a solution, and the magnetic needle shows deflection, It implies that the solution is good conductor of electricity and it is allowing electric current to pass through its passage between the dipped free ends of tester thus making the circuit complete. The electric current passing through conducting wire of tester, due to magnetic effect of electric current, produces magnetic field around it, which causes the deflection of magnetic needle. Question 3. Name three liquids, which when tested in the manner shown in Figure, may cause the magnetic needle to deflect. Question 4. The bulb does not glow in the setup shown in Figure. List the possible reasons. Explain your answer. Answer : (i) liquid A is a better conductor than liquid B. Question 6. Does pure water conduct electricity? If not, what can we do to make it conducting? Question 7. In case of a fire, before the firemen use the water hoses, they shut off the main electrical supply for the area. Explain why they do this. 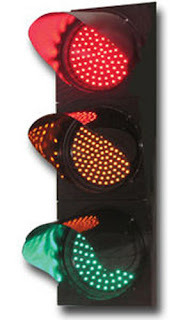 (ii)The using of water for putting off the fire will be dangerous, as melting of electric wire insulation, together with increased conductivity of wet surface, will lead to the leakage of electric current in the area, resulting in electric shocks to struggling inhabitants and fire men rescuing them. Question 8. A child staying in a coastal region tests the drinking water and also the seawater with his tester. He finds that the compass needle deflects more in the case of seawater. Can you explain the reason? Answer : We know that pure water is a poor conductor of electric current. The presence of some impurities in the form of some salt or acid, turns it to a good conductor. The seawater and the drinking water both contains salt impurities dissolved in them. The salt concentration in seawater is much more as compare to the normal drinking water. The presence of excess of salt in seawater makes it as better conductor of electricity than drinking water. Thus the child testing the the drinking water and the seawater, finds compass needle deflecting more in the case of seawater, due to excess flow of current in the tester. Question 9. Is it safe for the electrician to carry out electrical repairs outdoors during heavy downpour? Explain. Answer : The rain water, mixed with chemical impurities such as acids or salts in the air and ground surface, becomes good conductor of electricity. Therefor it would not be safe for the electrician to carry out electrical repairs outdoors during heavy downpour, as risk of electric shock due to leakage of current, working on a wet surface, will be always there. Answer : The rainwater is supposed to be as good as distilled water. But now a days due to increased level of air pollution, a lot of impurities or pollutants are present in the air.These impurities may be acidic or may contain some salt. All these impurities in the form of either acid or salt, get dissolved with the rainwater, and make it good conductor of electricity. This is for the reason, why paheli found the compass needle showing deflection on testing with a tester. (iii) The chromium plated kitchen and bathroom fixtures, such as Tapes, Showers, Water Sinks, Racks. (vi) The shaving blade with titanium coating on cutting age. Question 12. The process that you saw in Activity 14.7 is used for purification of copper. A thin plate of pure copper and a thick rod of impure copper are used as electrodes. Copper from impure rod is sought to be transferred to the thin copper plate. 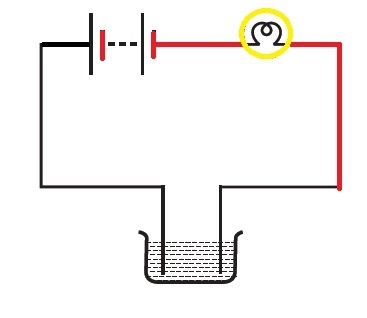 Which electrode should be attached to the positive terminal of battery and why? Answer : The electrode with thick rod of impure copper should be attached to the positive terminal of battery because in electroplating process, When electric current is passed through the copper sulphate solution,copper sulphate dissociates into copper and sulphate. The free copper gets drawn to the electrode connected to the negative terminal of the battery and gets deposited on it. An equal amount of copper gets dissolved from the other electrode with thick rod of impure copper, in the solution. 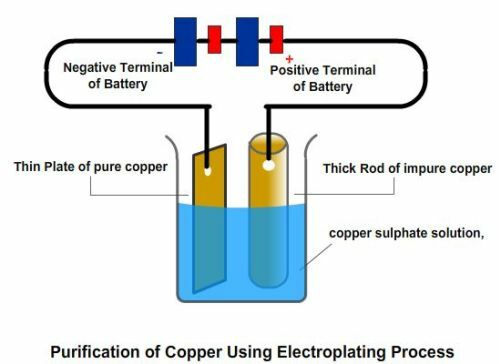 Thus,the loss of copper from the solution is restored .As the process keeps going , the copper gets transferred from positive electrode with thick rod of impure copper to the other electrode made up of thin plate of pure copper..
which is toxic. Therefore, used or broken CFLs need to be disposed off safely. 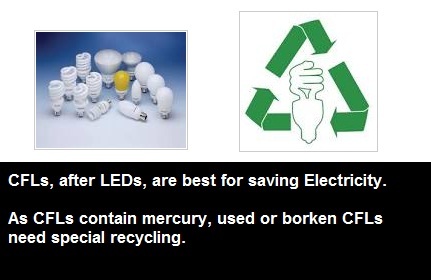 Once the technological advances reduce the cost of LEDs, they will become the preferred lighting source.